AMEA requested the inclusion of the state of Alabama in its new logo, along with some musical symbology. Overlaying the beatiful shape of the Treble Clef, but oversized, created some positive and negative space, while still keep the symbol recognizable. The Alabama Winds logo is clean and simple and makes use of negative space and positive shapes to create the image of an eighth note. The wistfulness of the letter “W” provides movement and a “windy” feel. 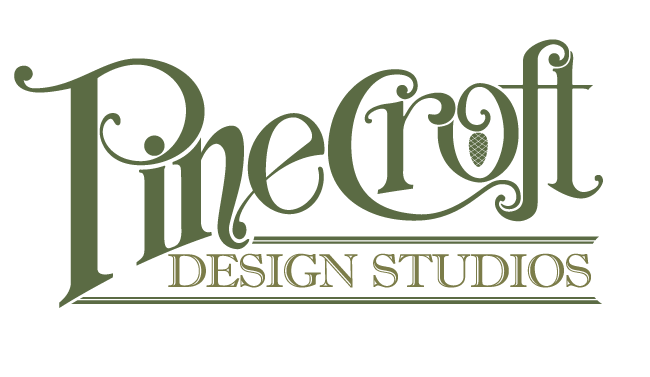 We selected a letterhead style font for Pinecroft Design Studios to really make this logo beautiful and decorative. We blended several existing font styles with modified lines and swirls that make everything work well together. To achieve a more feminine logo with lots of movement, we combined several simplified or embellished fonts styles. The leaping dancer helps form the letter “D”.